Welcome to any new visitors from the Mom It Forward site. Today I'm sharing a book my daughter checked out from her school library a few weeks ago that I think must have been written about Jyl Johnson Pattee (founder of Mom It Forward) when she was a little girl. Ordinary Mary's Extraordinary Deed, by Mary Pearson, is about an ordinary girl who does a simple act of kindness (sharing blueberries) but each person passes a kindness on and it grows to help billions of people. My 7-year-old loved this book and read it by herself then got excited to explain to me what Mary did. She "got it." It even has a chart at the back showing how the kindness spreads. Jyl started the Mom It Forward social media community to help other women, their families and community. In connection with this, she hosts weekly Twitter Girls' Night Out (#GNO) parties that make a positive impact world wide. She is also co-founder of the EVO Social Media Conference which I attended last summer in Park City, Utah. It was there that I made the decision to blog about my passion for children's books. Today I'm guest posting on the Mom It Forward site featuring a craft that goes with the Rainbow Fish book. 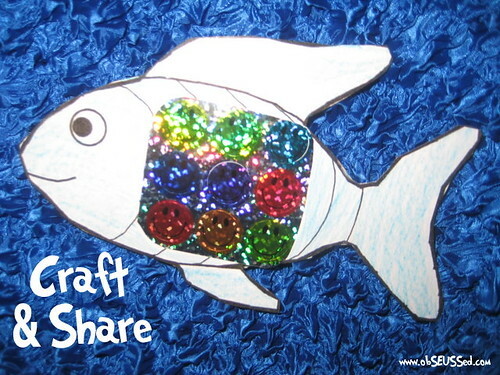 Stop by Mom It Forward to see how to teach your kids to give and share with the Rainbow Fish craft below. Get the FREE PDF printable of the fish I created while you are there. If you've just discovered obSEUSSed, take a look around and come back again. Thanks for stopping by. Remember to "Pay it Forward"
The book sounds lovely and I like the idea of any aid that helps me teach my child to share -it can be such a battle!!! 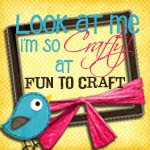 The craft looks cute too.. will go check it out! That book sounds cute! And, I love the idea of Mom it Forward.